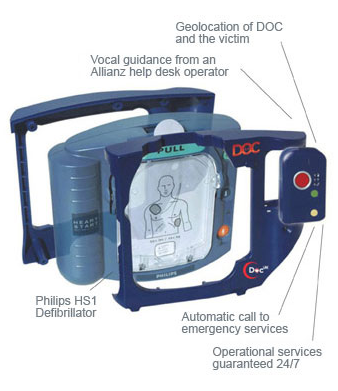 Many heart defibrillators in British workplaces would not be used in an emergency because of misplaced fears and lack of staff education, according to a survey released today by defibrillator manufacturer DOC UK. The firm commissioned a survey of 2,000 people which found that only 15 per cent of respondents reported they had defibrillators in their workplaces. Of those, less than half (44 per cent) reported that they knew how to use them, and 11 per cent said they had been trained, but would still not use it in a genuine emergency due to lack of confidence. The responses indicated that many people’s hesitations towards using emergency equipment are based on risks which do not exist. For instance, a defibrillator will only work on someone who is having a genuine heart attack. 61 per cent of respondents were concerned about injuring the casualty or being held liable if something went wrong and 11% of those reported that they would not use the equipment for fear of accidentally electrocuting someone who was in fact well. Overall a third (33 per cent) of respondents said they would not use a defibrillator under any circumstances. When asked how they would respond if a colleague appeared to be having a heart attack, only 10 per cent said that they would use the defibrillator first. The most common response (41 per cent) was that they would call an ambulance, attempt to find the company’s first-aider, ask any colleague to take over, or ask others what to do, all before eventually using the equipment. Unfortunately, none of these reactions would be as effective as providing immediate defibrillation.